Until I left our Josier House home in Kalpathy, even many years thereafter, there was not a single day when Siva-Puja Ritual was not done. Our father had trained all the sons to do this. The rice that we ate in the morning was the Neivedyam. Our father believed that since the Gods had given him the lands, the produce should be first offered to them, everyday. Whenever we could not perform the puajs - due to pollution caused by birth or death - it used to be taken to our Athai's house or to Prabhu Josier House, where they would do the rituals along with their own Puja. I recall an incident in 1939 or so, when my brother Ganesan was around one year old. My brother Manian had come on leave from Madras, where he was employed, and when he is at home he used to insist on doing an elaborate puja himself. He would do milk-abhishekam also. After the Puja, as usual, he was taking the Thaambalam with the abhishekam theertham to be poured at the base of the Coconut tree and poured it. Next day, during the Puja, he found the Soorya-spatikam (a crystal) missing and was upset. We searched in the cocunut base etc. could not find it. Shortly thereafter, Ganesan has chicken-pox, and the usual care was taken. Somehow, when this was cured, he had an eye infection which was treated by the Arya Vaidyan Eye specialist in Ambikapuram, Kannankuty Vaidyan. His one eye was closed. After a few days, Dr.Parasuram, who was visiting our father advised father to take him to Dr.Gurupatham of the Moses Gnanabharanam Eye Hospital, in Coimbatore. My mother used to cry for Ganesan - he was her fondest child - and he was taken there. Dr.Gurupatham said it was too late, the eye had been totally damaged and nothing could be done. My mother used to attribute this to the disappearance of the crystal. In 1942 or so, we celebrated my sister Pahi's daughter Rasaathi's marriage at Josier House. Her son Chuppamani and myself were cleaning the muddy base of the same cocunut-tree, to make it presentable during the marriage. And, I saw the crystal there ! I ran to my father to show it and he was very excited. Everyone was happy that it was found. 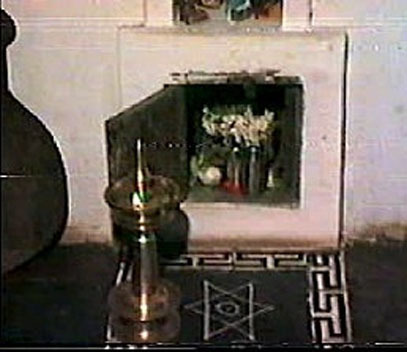 I am mentioning this to emphasise the significance the family had seen in doing the puja. It was a matter of faith.